Today it’s haibun Monday again, with me Björn hostin. As you might have understood I love to walk, to see a path before me, and just feel my feet moving me forward. This weekend I have walked both my mother and my mother in law, and for them walking is now a strenuous effort they can only do with the support of a walker frame. Yet when spring has finally arrived (and is more like an early arrival of summer) it’s easy to see how much walking does for them. 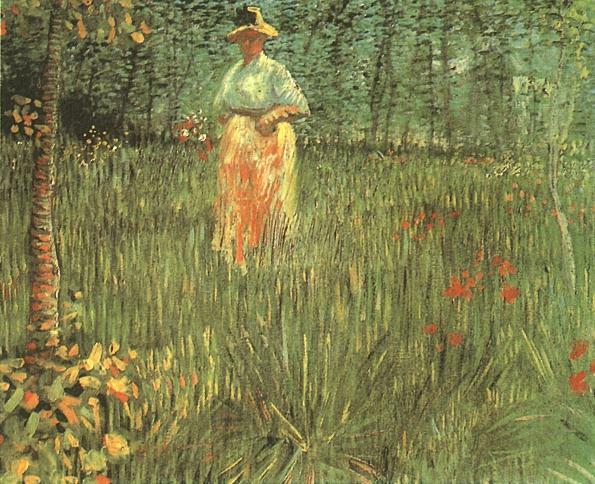 A woman walking in garden by Vincent van Gogh. Today I want you to write a compact (not more than three paragraphs) haibun inspired by the concept of walking. It could be a pilgrimage, it can be an exercise or just for the purpose of thinking, or finding yourself a visitor to nature. I have included a few quotes to inspire you, but if you prefer to not use them, that’s alright too. It would be fun if you could include a photo from one of your recent walks as well. ― Bruce Chatwin, What Am I Doing Here? So I want you to write your new haibun on this theme, link up below, and have fun reading what your poetic friends have written. Please link back to the dVerse site. Can’t wait to sink my teeth into all your poems! Wonderful to have you here… and now you are officially part of the team at the bar. Happy to see you! I’ll be reading poems in the morning — over my first and second cup of steaming hot coffee. Look forward to seeing yours. Welcome back! This is the kind of prompt that makes me want to write a plethora of poems, of any form. I think of my poetry ideal, Mary Oliver, and how the majority of her works springs from those walks, from her close connection to nature. At the moment, the dogs are glaring at me, waiting for their walk. Ah, you have inspired me and we are having a morning off walking in Rhodes. I will check on all your poems as I love reading them but it is our last day in this beautiful place and we will be off walking again soon! Nice to know he is looking out for my future. I love this prompt and that it is to be a haibun. I never did a haibun before dverse, and now I’ve done one or two on my own. My husband likes to read them as well. I think walking is so much part of being human… So I’m glad the prompt spoke to you. My mom has a candy apple red motorized scooter/chair and loves it. She also has one of those rollators and it is easy to push her around in that plus she can use it as a walker when she chooses. How nice to have a walk with your son on Mother’s Day and for him to be so concerned about your future. What a gift. I am so glad you are enjoying doing haibun. I finally found some flame decals and will be decorating soon. She fancies herself quite the Road Warrior. We’ll cover for you, Bjorn, until you can RUN, not walk, away from the craziness of work. Last night I was in negotiations from 9PM untill Midnight… today I have to continue working on reading some legal documents…. Legal documents…..my deepest sympathies. Hope you get to run, not walk, away soon. Hi Bjorn!!!! and I think of the TV sitcom Cheers when Norm walked in. Wonderful prompt. And here is a You Tube embed if interested of one of my favorite “walking” songs and videos…..
Much better. His voice is perfect for the song. Having walked in Memphis many times, I did enjoy this song when it came out. Next time you come to the US, visit Memphis. Skip Graceland. Especially during their Barbecue Festival Competition along the river….oh my!!!! My dearest friend is in East TN – her origins and then returned a few years ago to caretake her mother. I love their accents and the mountains in E. TN. W. TN is a different pace and voice inflection. Lord have mercy on us, folks in E. TN put mayo and dill pickles on their BBQ sandwiches. In Memphis, such a thing is a dousing in the Mississippi river offense. My mother is in middle TN – yet another take on that hospitable state. Where I obtained my undergraduate – Vanderbilt. Nashville – super city. So vibrant! they have one of the most beautiful public Japanese gardens in the East US. Exactly. One of “my” engineers (one I reviewed and licensed in the state) works there. Anytime I go through, I visit. Oak Ridge is like my home town of Durham, NC. Because of Duke U and their massive medical and law schools and people who go there and end up staying, very few old family “native” Durhamites. But great for diversity of thoughts and cultures that blend with southern culture. Oak Ridge is very different from most “towns”….and I know you know several of the reasons why. Nuclear energy does have a certain….element of fear and awe. A few years ago,I went to Memphis with a friend who wanted to visit Graceland. It did not move me like the sounds of the blues and the novelty of walking from one venue to the next to hear a variety of artists. We feasted upon ribs, catfish and deep fried pickles. Yeppers. Sounds like the perfect way to visit Memphis (or, Mumphis as they say) – food, music, the people. I enjoyed this music video, Toni! Good. Something in it really has appealed to me through time. Great prompt, Bjorn! Thanks for the opportunity to share my Mother’s Day adventure to the iris farm. I might have another involving walking the dog, but when you asked for a picture, I decided I needed to write this one first. First day in 7+ that the sun decided to shine in Boston! HURRAH! I was about ready to cut a circle and strips from yellow construction paper and tape it on my window 🙂 So — of course I went walking. Will do my reading tomorrow AM — over my usual hot steaming coffee. Looking forward to haibun reading Tuesday! Wonderful that you got some sun… we have had weather that feels like summer now for almost a week… But my spellchecker only tell me that haibun is wrong. Nope. I have my auto correct tamed. It didn’t used to like a lot of the Japanese but it has learned to accept them. We had an hour of sun today, this morning. Glorious. I want to plant my garden but it is too wet. Can’t mow my lawn either because of the wet. I feel like a forgotten mildewed book. I pulled out my violin and scraped out Here Comes the Sun hoping to encourage it. Natch. No go. Enjoy your reading and coffee! I think there are areas that would love to have some wet… maybe a sun-dance can help you. I wish I could send some of the wet their way. I don’t think I have the stamina for a sun dance. I’m an old fat cat who just finds a warm dry place to nap. Good morning dVerse poets! It’s drizzling over here in the UK but it’s early yet. Especially in Norfolk where anything can happen. We seem to have our own weather systems in different parts of the county. It might be sunny where I live but a few miles away where my husband works there could be hail! I’m just watching an early morning robin sitting on the composter – sheltering from the rain under some bramble leaves. No deer this morning – I think one of our neighbours (whose house is his holiday home so he’s only there for a couple of weeks a year) disturbed the wildlife with his ride-on mower! Goodmorning Kim… I think you have already started to write a haibun with your thoughts on weather. Walking is an ordinary, necessary, and beautiful part of living…can’t help but think of Adam & Eve walking with God in the cool of the day…paradise! Might write another one. Thanks, Bjorn, for posting and hosting here. Late to the party. Happy to be here. Coming lateish to the party but find it hard to resist haibun!